A window well is a great way to protect your basement from water damage and debris, but it’s also a frequently overlooked way to beautify your home. At Window Well Experts, we haven’t overlooked the aesthetic qualities of window wells. A window well lets natural light into your basement, and there are many ways to beautify your window wells and landscape, increasing property value and making your home a nicer place to live. Think of the inside of your window well as a canvas, bringing not only natural light but decorative options to your basement. Stacked stone window wells are a popular choice with homeowners looking for a rustic accent, but because of the gaps between the stones, it’s notoriously prone to leaks. You can get the good looks of stone without the hassle by purchasing Window Well Experts’ stone finish wells in galvanized steel or composite plastic. We also sell galvanized wells in a clean, beautiful white finish. For a bolder statement, consider one of our many mural-style window well liners, depicting nature scenes ranging from mountains to meadows, from forest to coastline. We also sell white reflective liners that increase the amount of sunlight that enters your home. While the interior of your window well is the face your family sees inside your basement, the window well cover is a way to improve the looks of your home from the outside. Here, too, Window Well Experts offers plenty of options. Our clear Polycarbonate well covers are almost impervious to scratches and discoloration, and they come in a variety of shapes. Our atrium dome covers, rising high above ground level and offering an unobstructed view, are a popular choice. For other homes, a sloped or bubble-shaped cover might look best. Because all of these covers are diagonal in shape, they shed water away from your home and are easy to clean with a garden hose. If you’d rather have a lower-profile window well, we also sell flat covers. No matter what shape you choose, all our window well covers are made to order, so they’ll fit your well and your home. Once you’ve installed and covered your well, it’s time to decorate the area around it. 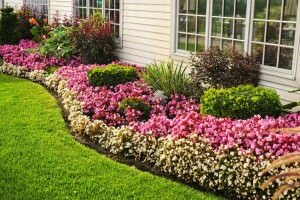 Many people choose to surround their wells with grass, but because a properly covered well will keep debris away from your basement window, mulch, gravel and rocks are all viable choices. A decorative stone or wooden border around the well is a popular option, but keep in mind that your well cover will direct rainwater and snow to the area outside the well, and make sure that anything you put in that area is waterproof. Beyond that concern, though, the ways to beautify your window wells and landscape are limited only by your imagination.